I bought a purple peace frog tee shirt and I just love it. It is so comfy and is still just as bright color as the day I bought it! None of the imagine has peeled off like lots of tee shirts will do. My grandaughter and I both loved the colors and quality of our shirts. I bought a large and it was very big. I Have this shirt in purple, pink, and green and I love them. 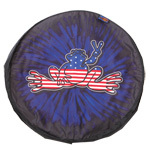 True to size and I always buy peace frog stuff!!!! 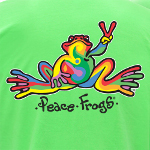 Peace Frogs reminds me of my younger days of tie dyed.shirts, bell bottoms and peace symbols. I have this shirt in purple. It is absolutely a gorgeous purple. The fabric is so soft and comfy. Easily my favorite shirt of all time. I am ready to get more in different colors! I've been a fan of Peace Frogs for years, and I love the classic retro frog design. I also love that it's organic cotton, too, and it's super soft and fits great! I got the hot pink and it's so pretty! I love Peace Frogs in general but this purple is perfect! I love it, the color is great and the fit is perfect. This is definitely a shirt worth buying. I bought it in multiple colors and I love it and love the retro design. They are true to size and so comfy. 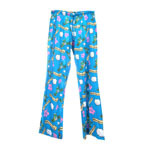 I wear them with my peace frog pants all the time. I would definitely purchase more shirts from you in the future. I love this shirt and all peacefrog shirts very comfortable. True to size & color... love it! I cannot get enough of these shirts! This is my favorite peace frogs shirt. Have it in a few colors. Good quality, great, bright colors. I could wear my peace frog shirt everyday and it is made so well that its durable and doesn't fall apart. It's the easiest shirt to get stains out of too. I love my new t-shirt. Colors are bright and vivid. Runs a little on large size. Had to swap down a size. Company made it a no hassle return and I received my new t-shirt very quickly. The wife and I came across Peace Frogs in a store in Long Beach Wa. 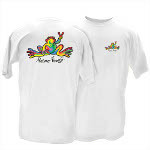 We immediately fell in love with the Frog and designs.... We picked up 2 coffee mugs, ceramic "Love,Peace,Happiness" frog, the retro frog t-shirt and the board meeting long sleeve shirt. Just placed an order for a few more shirts and flipflops for the wife. WE LOVE PEACE FROGS!!! This is a great looking shirt. The short sleeve purple is absolutely gorgeous paired with this retro-colored Peacefrog. I LOVE this shirt and get compliments on a regular basis when I wear it! Love the color (purple)! The tee is good quality too! I bought this shirt for my aunt in the green and she loved it... The material was great and it was true to size, I plan on getting it for myself in pink!!! I love the colors and how well they come out of the wash! 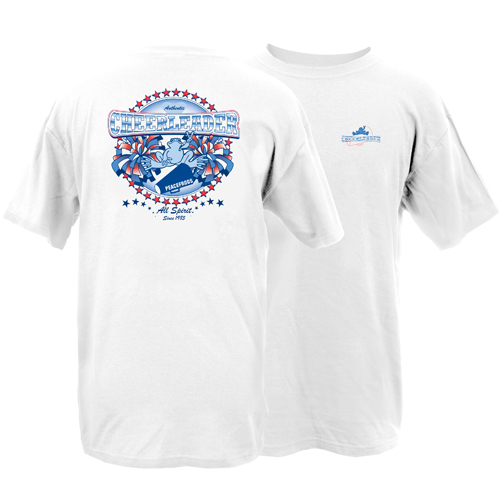 The cotton is sturdy and lasts years, a winner! 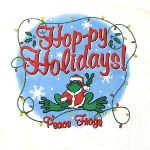 We have been wearing/using Peace Frog shirts, lounge pants, magnets, stickers, etc for many, many years. We are so glad to see the retro shirt return. From two aging hippies! I love this whimsical shirt, it is well made, the colors are vibrant, it came in a flash, and you can't beat the message! Husband bought me a long sleeve T-shirt in the 60's (I love frogs) and it lasted until 2011. He bought me this one for Xmas plus a long sleeve white Absolut logo. Love them both. Just bought another one for the beach. They get more comfortable as the years go buy. The most awesome frog on earth. I get lots of complements on the t shirts. Thanks! Had to return a shirt because of my mistake. Was taken care of with no problems at all. thanks a lot. My daughter has orange and purple my son a vintage shade, no matter what color they are all well made quality tees that do not fade or wear out. 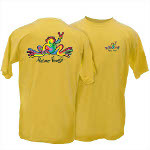 They love the shirts, I love the quality and variety offered, great line of clothing! Thanks! Great colors and great quality. Fun shirt! I bought two and wish I had got another bright one. 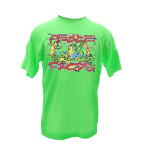 I love my peace frog t shirts. They are so comfortable. I love this shirt, I have it in a few colors. The only problem I have had is the color starts to fade in spots after a while.